The truth is…I stole this blog post from a great blog that I follow. I wrote my own mission statement which I will happily share at the end of this post. I hope you enjoy and do one of your own. 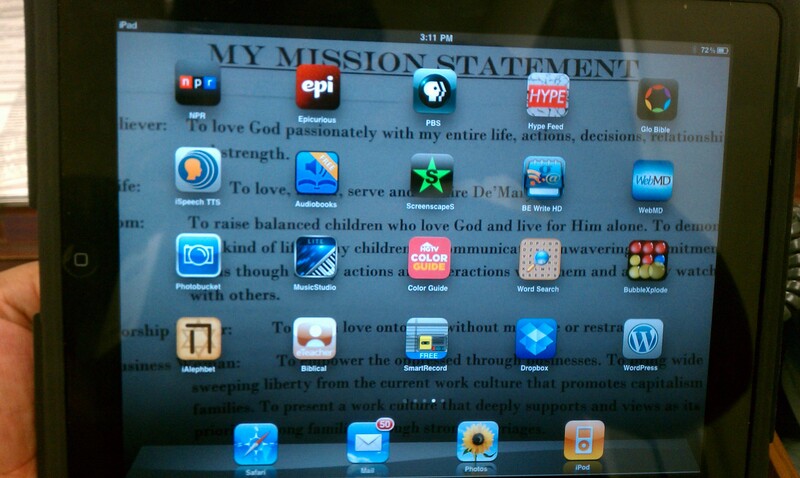 My mission statement is the background image on my iPad. I love it!! As a Believer: To love God passionately with my entire life, actions, decisions, relationships and strength. As a Wife: To love, honor, serve and admire him. As a Mom: To raise balanced children who love God and live for Him alone. To demonstrate this kind of life to my children by communicating unwavering commitment to Jesus though all my actions and interactions with them and as they watch me with others. As a Worship Leader: To lavish love onto God without measure or restraint. As a Business Woman: To empower the oppressed through businesses. To bring wide sweeping liberty from the current work culture that promotes capitalism above families. To present a work culture that deeply supports and views as its top priority, strong families through strong marriages.